Mel Snow met the love of her life in a desert saloon one night. Two days later, they are married. Toby is a magician hoping to make it big one day in Las Vegas. Only, he isn't your usual magician. He doesn't perform tricks of illusion like most magicians. He is a real magician, practicing real magic. He knows very little about where his magic comes from or how to control it, which makes him dangerous, not only to himself, but those around him. After a mishap with a former assistant, he swore off using humans in his act again. But that could only last so long. Mel finds a kindred spirit in Toby; both moving from place to place, searching for that which they've lost. Mel has her own magic, although it's never really described as that in the novel. She is a textile consultant and she has this uncanny ability to hear the voices and music coming from textiles. She is able to weave stories together from them, including her own. Toby has a charm about him that draws people to him. Mel can't help but begin to doubt that her own presence in his life wasn't something he concocted. Or is their love real? And while this is a significant plot point, the real story seems to be about two people trying to find their way in the world and come to terms with their pasts. Toby longs to rewrite the past while Mel struggles to understand it and find her place in it. Toby's story took center stage in the novel. However, when I had read the final page of the book, I came away feeling it was much more Mel's story. And that makes sense given she is the narrator. It's hard for me to talk about this book and my feelings surrounding it without giving too much away. The development of the characters over the course of the novel is an intricate part of its make up. This is very much a character driven novel. The author also introduces us to old time magicians who long ago lost their magic, a not so good magician bent on revenge, a brother who is called by the water, and a teenage runaway who wants to make a name for herself. Each of their stories serve an important purpose in the novel, giving the reader an even fuller image of Toby and Mel, both as individuals and of their relationship together. There is a beauty in the writing, in the descriptions of the desert and later Amsterdam as well as in the life given to Toby's magic. I was just as mesmerized as Mel in Toby's gift and powers. It wasn't until the second half of the novel, however, that I found myself completely drawn into Toby and Mel's life. The first half was interesting enough, but the story seemed to lag now and then. I think it had more to do with how separate Toby and Mel's stories seemed at that point. They seemed a bit disconnected from each other in those initial chapters. The novel grew on me though as everything fell into place, and, by the end, I was quite impressed. I used to think that magic realism and I didn't go well together, but I've since chalked that up to a bad experience. The Art of Disappearing made me believe in magic for the few hours I was reading. I left the book feeling satisfied and a bit sad. I look forward to seeing what the author has in store for us next. 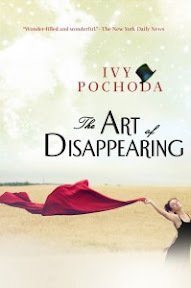 You can learn more about Ivy Pochoda and her book on the author's website and her blog. Be sure and check the TLC Book Tours website for other tour stops as well! Many thanks to the TLC Book Tours for the opportunity to be a part of this book tour. Book for review provided by the publisher. The publisher has been kind enough to offer a copy of The Art of Disappearing to one lucky person in the U.S. and Canada. In addition, I will be giving away my copy (read once) to someone outside of the U.S. and Canada--I hate to leave anyone out! To enter, please leave a comment with your e-mail address (unless it is very easy to find on your blog or profile page) telling me why you want to read this book (entries not meeting the full requirements will be disqualified automatically). The winners will be chosen in a random drawing. Deadline to enter is October 11th at 11:59 p.m. The winners will be notified by e-mail. Good luck! Hi Wendy! I love your reviews, they are always so detailed and well thought out. I'm so glad you enjoyed this book.. thanks so much for being on the tour. I love magical realism when it is done well, and I think that this book would fit the bill perfectly! Thanks so much for your wonderful review. I will be adding this one to my list! Thanks! The book sounds charming and I just love the cover. I love character driven novels and the element of magic in this one makes it even more intriguing to me. Thanks for the giveaway! I love when magic realism is done well and pared with beautiful writing. Wonderful review! And great review, as always. This book had you believing in magic and that's wonderful to me!! Sounds like one to be savored!! I would like to read this book because I'm a huge fan of magical realism and I've never heard of a story using magicians that sounded as intriguing as this one does. Oh..I would like to be entered for a copy of the book offered in the US. You make the book sound so good and of course I'm dying to know what you couldn't tell us for fear of giving something away. Plus, I think all of us could stand to be lost in magic for a couple hours. The premise sounds good to me! I'd love to win a copy of this book. Thanks for the great review, Wendy! This sounds like a great read, thanks! for sharing. This sounds lovely please throw my name in the hat Wendy. I'm a big fan of magical realism. I did really like this book much more once they got to Amsterdam. But it all felt like there was just too much going on for me. I would love to read this book because I truely believe in magic, and I love to read stories about it. I love how eclectic a reader you are! (I feel I am one as well, so it feels great to find a kindred spirit.) This review really grabbed my interest as it's not like anything I remember ever reading. I'd love a chance to win and read!! Thanks for a great review and a peek or two at Parker. I'm having a giveaway of my copy of this book. I linked to your very good review to encourage people to sign up. Here is the giveaway post>. Great review. This sounds like a good read and I do love that cover. However, don't enter me. I don't know what to do with all the books I already have. Staci of Life in the Thumb and Alice of Hello, My Name is Alice are the lucky winners of the book. Copies are in the mail! Pardon Me . . .